Try a different look this festive/wedding season with these lush outfits fashioned from traditional silk saris of Bengal. We came across this store on the crossing of Park Street and Camac Street stocking clothes and accessories for men and women in silk, that too in eye-popping colours. Tantuja, a government-run chain of handicraft-based stores, has come up with this range made from traditional Baluchari sarees of Bengal which are handwoven in richly-dyed silks. They have fashioned gorgeous jackets, dresses, shoes, bags, wallets, and belts out of them. The shop on Park Street is the result of a project by the state government which is attempting to save the dying art of Baluchari. They have roped in city designer Abhishek Dutta to craft richly-detailed clothes and accessories that will attract the young. And we think it’s working! The opulent mood of the grand Balucharis and richness of their colours have been tweaked with a playful touch. We loved the narrow, cigarette pants and crisply-tailored jackets, perfect for weddings and elaborate parties. 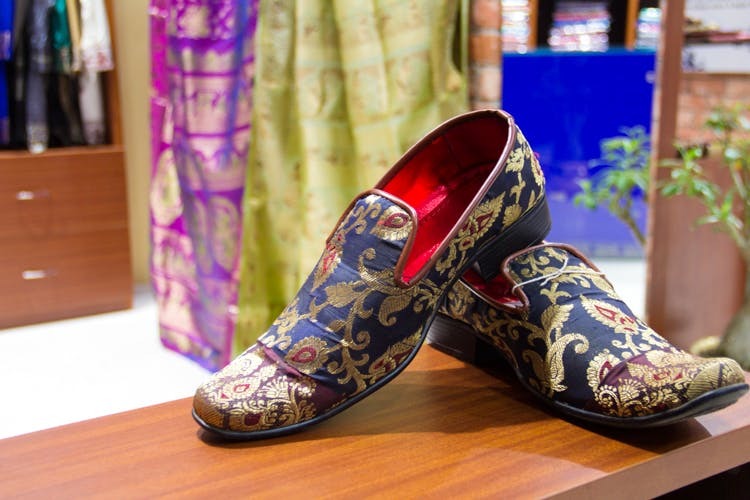 The brocade effect complements any single tone kurta or shirt you may wear under it. We loved the ones in pale cream and blues. They had a lightness while maintaining the material’s sumptuousness. The range should have more variety in colours. Pair these up with plain. solid colours and you are good to go.